Although WordPress has made it very easy to create a custom WordPress theme, but it still takes time to learn and build it. So I’ve created a Base theme based on the free Basic theme from Themify. I’ve stripped out the framework and the extra functions that you might not need. It includes only the basic styling, responsive design, custom menus, and widgetized sidebar. 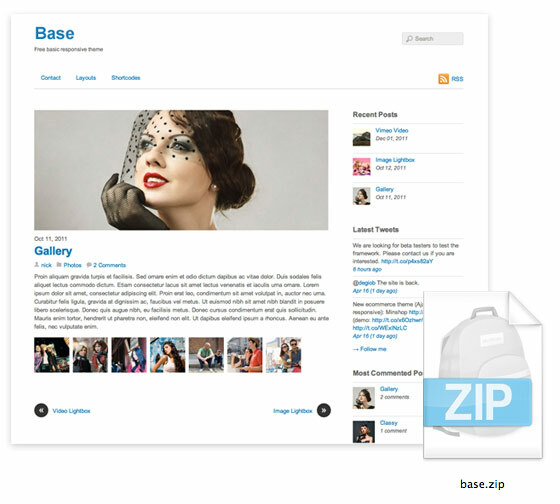 This Base theme is intended to let you build your custom themes using it as a foundation. The main goal is to save your time and simplify the work flow. It is great for non-coders and quick client works. The list below explains all the template files in the theme folder. index.php = template used in archive, tag, search pages, etc. functions.php = contains the theme functions such as: sidebar widget, menu registration, pagination, etc. There is a filter in functions.php file (themify_add_video_wmode_transparent) to wrap the video embed with <div class="post-video">. This filter only applies to the video embedded via the post content using the video URL method. The .post-video wrapper is required to make the videos responsive. If you are embedding videos manually using the HTML embed code, wrap <div class="post-video"> around the embed code to make it responsive. The mobile navigation jQuery function is in ‘js/theme.script.js’ file and the styling is in media-queries.css. The basic column grid (col4-1, col3-1, col2-1) is included in the theme. The .first class is only required in the first column for spacing and clearing purpose. To add more navigations, copy and paste the code from the register_nav_menus() function. Then you need to specify where to display custom navigation in the template file. The theme_location parameter should match the location ID in the register_nav_menus() function in the step above. You can change the menu container, menu_id, menu_class to anything as you like. For best practice and to avoid conflicts (in case other plugins are included in the same script), wp_enqueue_script and wp_enqueue_style is recommended to include scripts and stylesheets. You may add the wp_enqueue_script in functions.php file. The Base theme only incudes the basic template files. You may create your own templates for more specific pages. For example, you can create a home.php template to be used specifically on the homepage or category.php for category pages. For more details, read the Template Hierarchy documentation. It is completely free for any purpose. Thank you so much Nick! A great help!!! I can really see myself using this for creating a child theme, and its free! Thank you so much WDW! This ‘basic’ Theme will prove extremely useful. More clients are asking for responsive Themes so this Theme will suit these needs too. Awesome! Thanks for this, Nick. I was fussing over the Bootstrap framework and a few other kits. This’ll definitely speed things up. Very helpful ! Thanks for this great work and sharing ! Thanks for the article I will test this theme which sounds really interesting adn easy to modify, add some design and publish wonderful websites with it. Thanks for your effort and your time! Looks good. Is there any chance of a demo though? Unless I missed the link? This is amazing – thank you. Where’s the menu though when I’m looking on my iPhone?! It disappears – am I missing something? You are doing amazing work as always, Nick! Beautiful theme and each post you publish is outstanding! Thanks for responsive part as well! Muestra algo mejor (si es que lo tienes) y así podrá tener peso tu tonto comentario. Saul. I think Nick created this theme thinking on giving all of us a framework and not a ‘state-of-the-art’ WP Theme. Just like ‘Starkers’ from Elliot Stocks. So this theme is not suppose to look ‘pretty’. You are the one that should make it work and look great. Nick, thanks for the great theme!! Your tutorial is very comprehensive and useful, like all your other posts. I have started to create some WordPress themes and this article helped me a lot, but I don’t have a portfolio yet. So, my question is: do you know where I can showcase my work and get feedback from others, can you give me some suggestions? Hi John, there are a lot of places where you can showcase your work, some paid some free, some with a mixture of free and premium accounts. It depends on what you design/code/build. If your works are quality material you could try to showcase them on Envato, but they would have to be amazing. You could also try some WP coding forums, as most forums have a really nice community always eager to help you, and allow you to improve. Now, there is no perfect solution to present your work, especially when you are on a tight budget, but I have come to like and to promote an interesting assets portal, called creattor.com; they have a nice community and an entire section of the site dedicated to WP, and I have seen that people could upload their own custom preview, thumbnails and screenshots. The portal is still in beta, but it’s gathering momentum and more and more followers; you could find a place for your work there. Good job. All I need by now. But you’d help me a lot if you’d made it with category.php, tax.php and achive.php pages too. Awesome work, keep it up dude. cheers for great work. I don´t know if the owner of this site is a dude or a dudette but i have to say that this template FREAKING ROCKS!! You´ve saved me a bunch of coding time! Keep the freaking awesome WORK! Looks very useful. Any chance of a Github repo for forking? Awesome work! Its easy for non-coders to do a wordpress theme! Tks! Sorry, but I am lost. I dl the theme, installed on my personal WP, but now how do I make changes? Congs, congs and congs. So simple and easy-to-change coding. I’ve been planning to build my own simple template, but since I have one already I don’t need to work on that. is it working with internet explorer 8? Because on my phone everything is peachie but when i look on my pc with explorer8 i get pop up with aplication error memory could not be “read”.??? This theme is really cool, I liked it and thanks nick for this freebie. Amazing, as always, Nick. Each your post brings me something new and really useful. Thanks for that! Thanks a lot for this theme!! I was wondering if anybody else has a problem with the main menu and header not appearing on the iphone?? Thanks! Thank you, this is very helpful, I look forward to putting the base theme to use!! I’m going to give it a whirl right now on a new site I’m building. Nice post, it is’t often that you find a give away that is actually useful, I have just forwarded the link to two of my colleagues, good stuff. simple nice theme thanks for sharing. tnx, downloading to take a look at it. 2. little ‘bug’ which occurs @ Firefox 11.0 (not tested on other browsers). – viewing on laptop / pc. – full width has search top right. – resizing to mobile format kicks in the little search button. – clicking that button shows the search input field. – clicking it again makes it disappear, nice. – however when I resize it too full width version, the search input has disappeared. Chances are slim that a full screenr will watch it on mobile width, but perhaps someone has a nifty solution to it. I am challenging myself to learn html and css, so this could be a great starting theme for my very first custom built wordpress website–Thanks mate! Is there any link for a demo? Not only a great base theme to work with, but lots of info on how to use and modify it. Not visited WDW for some time, almost forgot how good it is. Thanks you for sharing such a useful information. Wow, I’ve been looking into stripping down WordPress into a base theme for my projects. There are already many themes like this all over the interweb. But thanks anyway – looking forward to downloading and digging deeper. Thanks! It is very helpful. Cheers! Thank you for this good tutorial. As designer is it usefull to make you`re custom wordpress theme. A gone this tutorial use by mine Genesis theme het is easily to make child themes. Thanks voor this. Thanks for the theme! Its great! I was refering to the nextpage code. oh. i figured out. it works :) i need to use the editor to insert next page instead of typing the code. That is a great theme, i think that more wordpress sites would run faster if they stripped out all the unneeded modules and functions. This really nice theme. Since I use drupal I wish you could do a similar post for the drupal theme. Great! Nice & clean and with a good documentation. Thank you for sharing with us. umm this is good idea great work…. helo every one this is nice and amzing site check it.. This is another good source of WordPress free theme. This is easier to navigate and to create a customized WordPress Designs. I’m using one of Themefy theme in my personal blog, and this one looks simple and cool. Though you could’ve added a demo link. Thanks for sharing this theme! We will changing our current theme http://www.itmasterservices.com/wordpress/ over to this theme! thanks for sharing, awesome template! Very simple base theme. I like it. I sometimes wonder where to start when making a wordpress theme. This one may come in useful on my next project. Thanks for sharing. Awsum templates… it would be great if u add some script for drop down menu !! Really simple and quick responsive theme. Really easy to use and clean template. The theme is good and nice. Its simple and great color.Liked it. Nice design. Great theme, thank you very much!!! I did put the navigation in the sidebar. Any suggestions on how I can get the navigation above the post when it’s opened with a mobile device, besides putting the sidebar above the content? Awesome template I love these clean free themes. Simple and easy to use. I really liked this design, may be I can use this in future and this can also help me in getting new designs. Thanks for sharing. I’m very happy and glad that you shared your effort and blog-theme with us!! Currently I’m working on a re-design, where I’m trying to set 2 sidebars. One on the left hand side, and one on the right hand side, content in the middle. Unfortunately I don’t know how to realize that, although I think it has to do something with the get_sidebar include, e.g. in the page.php? What would I have to do to get one sidebar left, content centered, and one sidebar right? I Freakin’ love it!! Can I get you to build a site like this for me? how about mobile responsive ? Welcome to this special site .Here you can get free information. Thanks for free responsive design theme. Cheers to your kindness & generosity! :D I’ve become a huge fan of the themes built by Themify, as they are some of the cleanest, simplest and most effective designs I’ve seen. At least I thought that was the website I worked on for the day I wasted. I think advertising to make a free website and then just taking it away is false advertising. I will remember not to use this site again. Should I rename all instances of the Word “themify” and replace it with what I have named the theme ? I have used twentyten for the most part as my base theme, but I find alot of useless stuff in there, so I am going to give yours a try! By the way, I hav enever posted here before and I really like your site. Muchas gracias for this theme ;) will be handy when it comes to building similar ones in the future. Thanks alot for this its just what I was looking for. Can anyone assist me with centering the the menu links? I’ve tried using the text align but that doesn’t seem to work? One Question, why is jQuery not included in the theme, but there is some code that needs jQuery to be involved, for example the scrool to top? Thank you so much for this theme :)! I’m so grateful. You’ve saved me so much time. I can’t wait to get started! I’ve been using this theme for some time now and it sure is one of the best around. Child themes are easy with it!